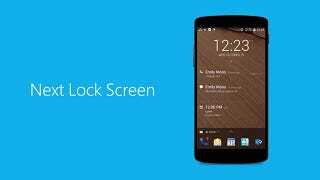 If you haven't heard, Microsoft has kicked open the doors to its experimental Garage development hub, and among the projects now available for beta testing is the Next Lock Screen app for Android. Lock screen customization is nothing new, but this effort from Redmond is worth a look for the way it brings information, apps and settings right to your front screen. Essentially, it's all about what you want to do next, so the name of the app makes sense. Once you've got it up and running on your device, it sits on top of your existing lock screen—so a PIN or pattern will still be required to get into your smartphone, if you have those security features enabled. Your text messages, calendar appointments and other notifications are shown on the screen by default—tap on any item to jump to the relevant app or swipe down once from the top to jump into your central home screen. Swipe up from the bottom to access apps and settings, and you can configure three different configurations here: At Home, On The Go, and At Work (with separate wallpapers for each). To change the apps and settings that appear, hit Edit apps and tools. As soon as you delete a shortcut from the grid, a plus symbol appears, letting you add something new from your app directory. Alternatively you can tap on Settings to change various aspects of the program's behavior, such as whether or not SMS snippets are shown. It's handy to have a different selection of apps instantly available to you based on where you are, and of course Wi-Fi and Bluetooth toggles are always welcome. Another useful feature is the ability to block certain apps from appearing on the lock screen if you want to keep things clean and simple. Tap Feedback if you want to let Microsoft know what you think.